Think out of the box and elevate your ideas. We bring you a brand new bundle of 800,000+ royalty free stock vectors & photos. This mega bundle includes icons, textures, illustrations, stock photos and much more. 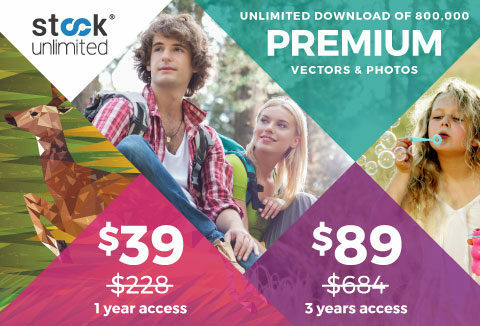 Grab 800,000 royalty free stock photos & get Photoshop VFX bundle FREE! You get 2 options to chose from - 1 Year access and 3 years access. Simple licensing (use for any personal or commercial projects: In case the clients want to use for printing/resale purposes, they need to purchase extended license (at $20 each image). Choose your preferred membership and to go vector hunting today! & get Photoshop VFX bundle FREE! The best deal ever. Use it every day, several times!! Maximum creativity Guaranteed! Thanx and keep up the good work! Very good product for the best price! I think this may prove to be the best deal I have ever bought anywhere! Extremely useful. Great Service from DealFuel …. It’s best wish..!! !